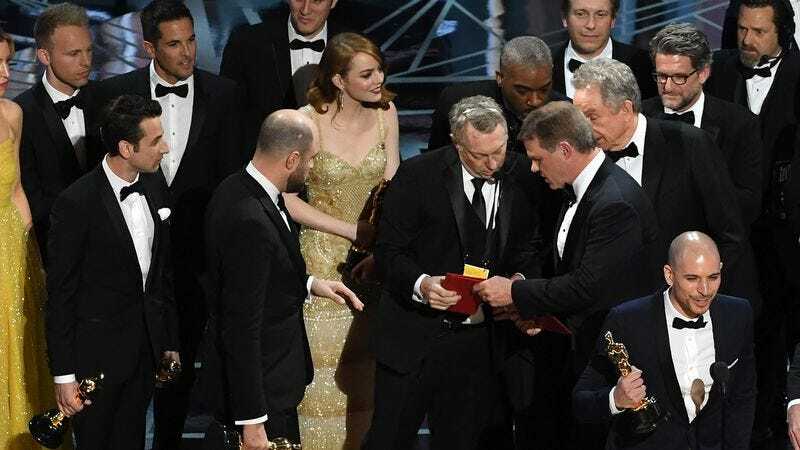 Many viewers were left wondering about the sequence of events that led to the initial erroneous declaration of La La Land as the Best Picture winner at the Academy Awards Sunday instead of the real winner, Moonlight. The Onion breaks down what you need to know about this fiasco. A: A $35.9 billion professional services network that handles business consulting, tax planning and compliance, actuarial advisement, and printing out slips of paper for celebrities to read. Q: Who is to blame for the mixup? A: All of us for putting so much pressure on the academy. Q: So presenter Warren Beatty isn’t at fault? A: In this one situation, apparently not. Q: Is this the first time such a mistake has been made? A: No, awarding the wrong film is a time-honored Oscars tradition. Q: How is the cast of 'La La Land' handling the upset? A: The cast and crew are doing their best to cope with the shame and embarrassment of sweeping the Golden Globes and winning six of their record 14 Academy Awards nominations. Q: What will be done to prevent similar mistakes from happening in the future? A: Academy president Cheryl Boone Isaacs confirmed that the Best Picture category will be scrapped at future ceremonies.